A government-sponsored nationwide cultural festival, the first of its kind, begins today (Friday) with Cultural Affairs Minister Asaduzzaman Noor saying the two-day event was aimed to instill a sense of civilizing values among youngsters, reports BSS. 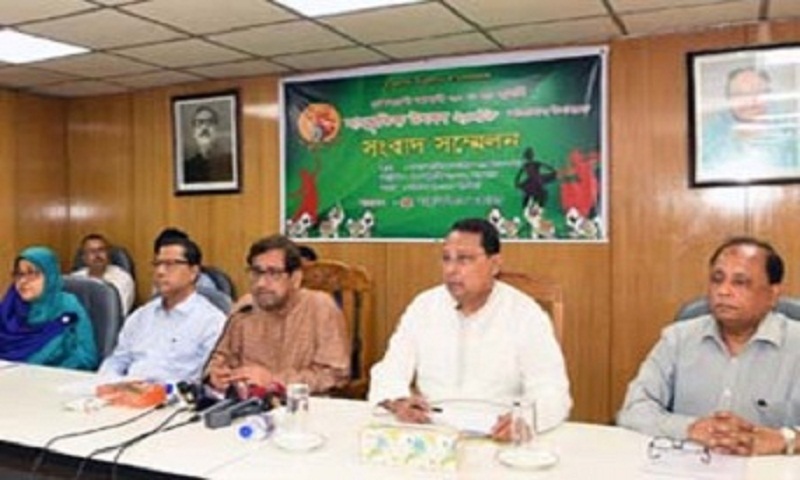 “A committee regarding the cultural festival will be formed in each district across the country under the leadership of deputy commissioner….the ministry has already given necessary directives to all the DCs,” Noor said while addressing a press conference at the Press Information Department (PID) Secretariat in Dhaka. “The Cultural Ministry is making continuous efforts to create awareness of country’s own culture among the people of all strata, including young generation” Noor added. Local artistes, poets and writers will take part in the event, the minister said, adding that local artists will perform Rabindra and Nazrul sangeet, modern, patriotic and folk songs, poetry recitation and single acting during the festival. Information Minister Hasanul Haq Inu, Information Secretary Abdul Malek, Culture Affairs Ministry Secretary Md Nasir Uddin Ahmed and Chief Information Officer Kamrun Nahar were present at the press confernce.